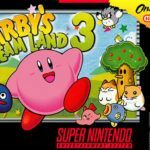 Kirby: Nightmare in Dream Land (AKA Kirby: Yume no Izumi Deluxe – 星のカービィ 夢の泉デラックス Hoshi no Kābī: Yume no Izumi Derukkusu / Kirby of the Stars: The Fountain of Dreams Deluxe in Japan) is a 2D platform video game developed by HAL Laboratory and published by Nintendo for the GBA in 2002. The game was the first game of the Kirby saga for the Game Boy and it a remake than of Kirby’s Adventure, which was for the NES Platform and released in 1992. It was followed by Kirby & the Amazing Mirror. In the game, the evil King DeDeDe has stolen the Rod of Dreams (which enables the citizens of Dream Land to, well, dream). For the citizens to dream, Kirby has to get the Rod of Dreams back, which the king broke into pieces and distributed throughout different realms. Despite its similarity to Kirby’s Adventure, Nightmare in Dreamland features improvements in both gameplay and design. There are also additional features such as new mini games, multiplayer via link cable, and numerous abilities to acquire. The game serves as a good start for first time Kirby players and for Kirby-terans. Kirby may be fluffy, cute, and pink, but he can inhale and absorb his enemies’ abilities, and in this game, he will go through around 40 different stages and 30 different enemies. Improvements in graphics can clearly be seen. In Kirby: Nightmare in Dream Land, the artwork is now livelier, the characters are cuter, bosses are larger—in short, the game looks so much better than Kirby’s Adventure. Unfortunately though, while there are enhancements in the game’s sound effects and BGM, these are barely noticeable due to the GBA’s weak speakers. But there is always the option to use your own headphone for the sake of appreciating it all. Compared to most games, Kirby: Nightmare in Dream Land is not very challenging but it is also difficult to complete it to one hundred percent. You need to find all the hidden doors—and some doors can only be found in hard-to-reach places throughout the game. Still, you could finish the story in a couple of hours if you want. What makes the game exciting is that there are different abilities Kirby can use to find hidden doors. It is not the usual weapons or powers upgrade for the hero. But, most enemies have different abilities that Kirby can absorb (you could even mix some together). All told, this puffball’s new adventure for the GBA is enjoyable and will keep you happily busy. Kirby: Nightmare in Dream Land game has only been ported to the Game Boy Advance.